"One thing against another creates"
Simply put: perhaps nothing happened last year in Marienbad. Alain Resnais’ film L’ année dernière à Marienbad attempts, through all its extreme paradoxes, to focus on the possibility that the fallacy of memory is found in man, obstinate in his quest to remember an encounter, and not in woman, who remembers nothing of the encouner. The reality of that event is lost in all attempts to make it recognizable and also to give it a consequence, or some kind of significance in relation to the present. I write about Resnais and his much debated film because, having rewatched it years later, I still find that physical space is the constant presence throughout the movie, even if metamorphically speaking such a thought is definitely unreliable. Apparently solid and immanent, the architectural space reveals a state of impermanence, which is reflected in its own representations of an ambiguous nature – it’s almost as if space digs deep within itself to find or extract its true significance, which is also expressed in other dimensions that are more or less real. 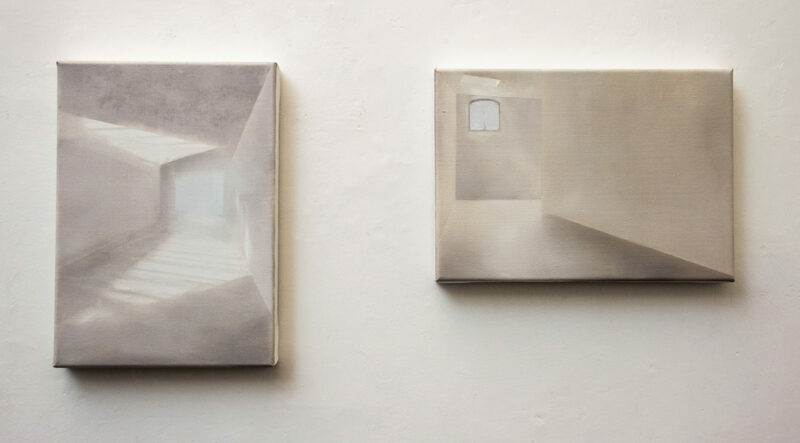 The refined element of time seen in the works of Andrew Smaldone is derived from the observation of architecture and a similar extraction process. Space generates images that are related to a memory the artist had where art as a practice, as a development, or as a perception occupies a series of rooms: an art school in London, and a non-profit gallery in Italy. In the moment in which they are portrayed, abandoned of their original purpose, the architecture Andrew paints reveals that the artist has conserved a dormant memory of their history; namely, what they contain. It is something akin to the visions of the characters in Resnais’ film, something that has not hardened into a definite shape, but it keeps changing, it keeps its form and is still able to be modified by those who return to lift the curtain in order to let the light in. the solitude of space deprived of its function, and ultimately for the contemplation of time. Time understood as an eliptic period, where there are no regrets, and with the clarity of those who understand the frictions of history; desire positioned in a state of existence that perhaps never occurred, and surely not under the physical conditions of the tangible world. The solitude of space reveals the solitude in time.